DXD A/D conversion, DXD and DSD D/A conversion, 32 bits resolution, coaxial S/PDIF inputs, single-ended analog inputs and outputs on gold-plated RCA females, IR remote control with HID capability, external clock input with clock info output, phono EQ in digital domain, input gain 0dB to 62dB, input impedance continuously settable 10 Ohms to 50k Ohms, same form factor of all Evo Two products, can be powered by any 7.5V to 15V power supply, Evo Clock Two and Evo Supply Two recommended. 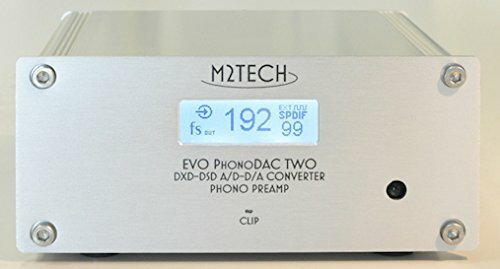 The Evo PhonoDAC Two is a very high value-for-money digital/analog combo capable of converting analog to digital up to DXD and DXD and DSD to analog. Its bi-directional USB 2.0 Audio Class compliant port is natively supported (no driver needed) by OSX and Linux. An ASIO-compliant driver for Windows is provided. High precision, low-jitter clocks allow for exceptional detail resolution, maximizing the 32-bit capability of the ESS Sabre ES9018K2M (D/A) and ES9102S (A/D)conversion IC's. The Evo PhonoDAC Two versatile analog input stage allows for setting it's gain from 0dB to 62dB, allowing for any low-output cartridge to be directly coupled to it, as well as line-level sources like CD players, tuners, tape decks, etc. Input impedance may be set to any value between 10 Ohms and 50,000 Ohms, accommodating all kind of cources. The Evo PhonoDAC Two is capable of performing real-time, digital domain phono equalization, using any of the 26 EQ curves provided with it. Ancillary filters like anti-rumble, anti-hiss and MPX allow for best playback and ripping from warped, scratched or worned records, as well as from cassette tapes or FM and AM broadcast. The Evo PhonoDAC Two de-jitter feature allows for exceptionally good performance from coaxial and connection. The Evo PhonoDAC Two uses high quality polypropylene capacitors and a low-noise opamp in the analog sections (input and output) for best sonic results. The IR remote control allows for accessing all Evo PhonoDAC Two features (volume, balance, muting, input selection and many other menu settings), as well as taking advantage of the HID protocol to control the player on the computer without manually accessing the keyboard. If you have any questions about this product by M2TECH, contact us by completing and submitting the form below. If you are looking for a specif part number, please include it with your message.